I have paired-end mouse RNA seq data mapped with Hisat2 and STAR. The alignment rate of one sample is not satisfactory for both methods. I have searched all the possible reasons, but still didn't find a good reason and solution. Please help me analyze this problem. 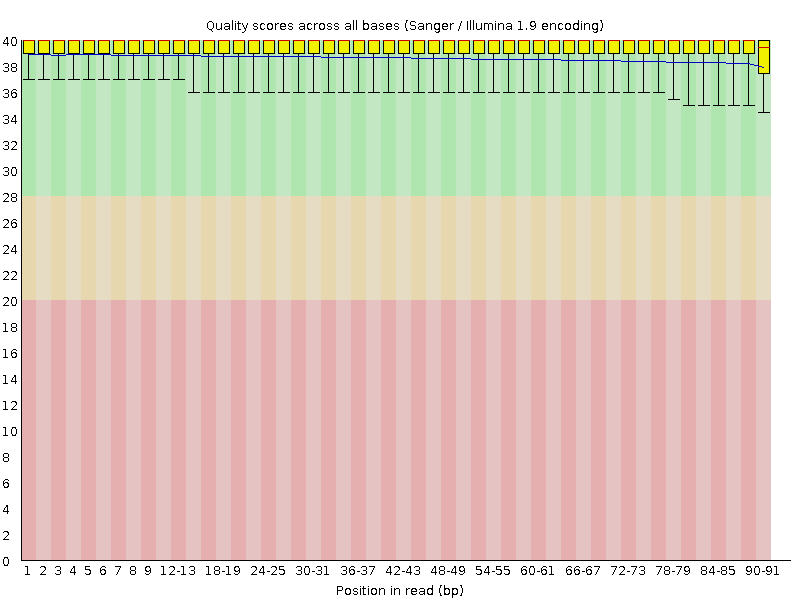 Before doing alignment, I trimmed off low quality reads with Trimmomatic, checked the quality of the data with fastQC, and also removed rRNA using sortmeRNA. One of the samples showed poor alignment about 40% while other samples showed good alignment rates around 70%-90%. Below please find the command I used for Hisat2 and its results. 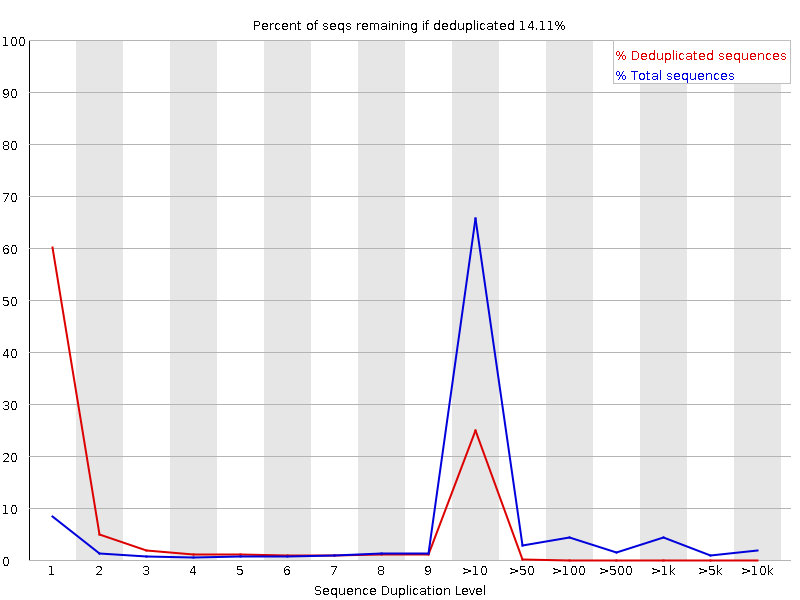 Can anyone help me find out the reason of Hisat2 poor alignment rate and STAR'S high rate of % of reads mapped to multiple loci ? It's possible that you have contamination from another organism, or other non-genomic contamination. Since you ran FastQC, posting the results would be helpful. Otherwise, I suggest you perform adapter-trimming and also BLAST a couple thousand unaligned reads to see what they are. Thank you for your suggestion,Brian. The quality of the reads is quite good(first picture). The adapter content is also very low (second picture). What looks a little strange is the Per sequence GC content (third oicture) and Sequence Duplication Levels (fourth picture). Yes, as you said, I will BLAST some unaligned reads to see what they are. I will post the result after I have done the blast. Below, please find the figures of the FastQC result. It is better to stick with one aligner for a project. NGS aligners have many nuances built in (keep in mind that even if you do not explicitly change some options they all have/use default values, which can affect the final result) and trying to compare results from two aligners may prove a futile exercise. BTW: Are you sure SortMeRNA has done its job well? Did you have a lot of rRNA contamination? Thank you for your answer, genomax! The reason why I use different aligners is that I want to select a best pipeline for my data to do the downstream differential expressed genes (DEG) analysis. I really see a significant difference of DEG results between different aligners. I am quite disappointed by this, I hope they can get consistent downstream resluts. If the first alignment step has so much influence on the downstream analysis, how much confidence can I have in the final results if I just blindly choose one... It confused me. For the SortMeRNA, the command line and the last lines of log file can be seen below. 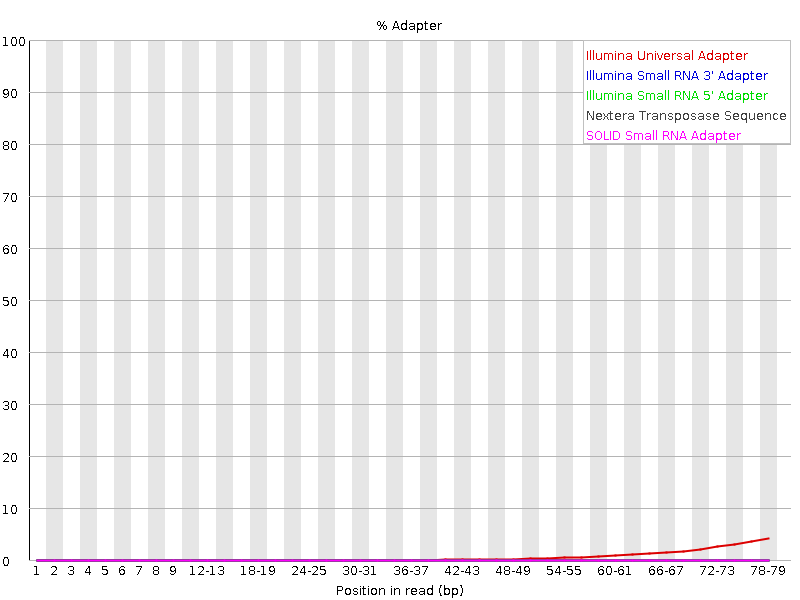 I used Hisat2 to align the data to the mouse rRNA, the result is none of the reads aligned to the mouse rRNA. Maybe Hisat2 is not a good tool for this test? I then use BWA to do the test. I will post it if here if there are some intersting results. STAR is an aligner many like so you may want to take that into consideration. If you are up for it then I will suggest that you try bbmap.sh from BBMap suite. @Brian is the author of that program. You would want to take into consideration ambig= option when considering what to do with the multi-mappers (they may not necessarily be rRNA). It should produce results as good or better than any other splice-aware aligner out there. Thank you for this advice genomax! I will try this tool out and see what will happen. It really confuses me that this sample has so poor alignment rate and so many multi-mappers, when everything else seems good. I will post the results to see what BBMap can do to help me analyze this problem. Your samples probably differ significantly in rRNA contamination. Do you have sorted files of rRNA reads for two samples? Do these files differ significantly in size? What is the size of kept file and discarded file for each sample? Thank you for your answer, Satyajeet. I used SortMeRNA to filter the rRNA, the command line and the last lines of log file can be seen on the last reply above. After SOrtMeRNA the sizes of kept files of non_rRNA_1.fq are around 13 G, no big difference between poorest sample and the best alignmet samples. 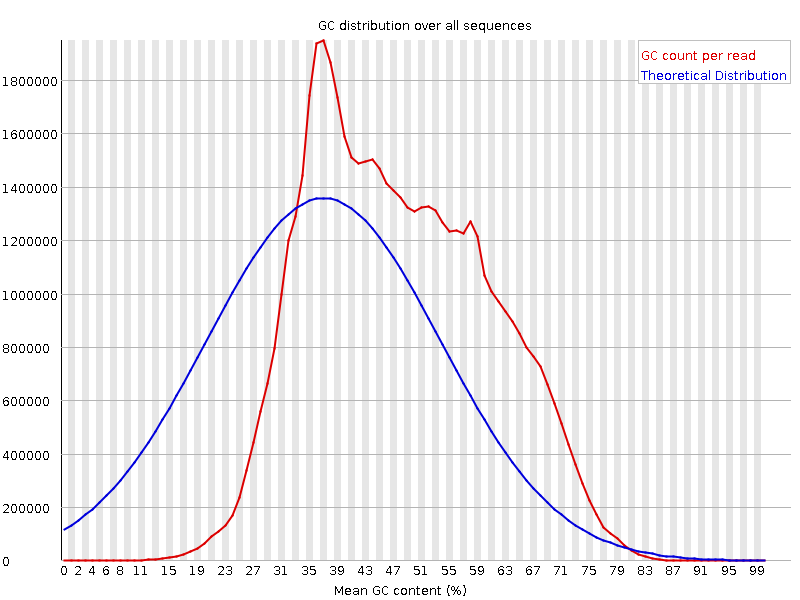 The sizes of discarded files of rRNA.fq are 1.1G to 2.0G, not so much difference? What do you mean by "sorted files of rRNA reads for two samples" in your first question?